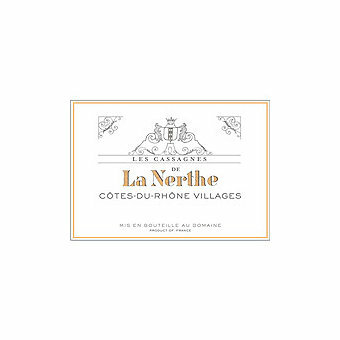 Chateau La Nerthe is one of Chteauneuf du Pape’s oldest estates and a benchmark producer of the region. Located in the heart of the appellation with the 225 acres of certified organic vineyards. This Cotes Du Rhone Villages is only the second vintage produced by this estate which has only produced Chateauneuf du Pape AOC wines up until then. The Les Cassagnes vineyard is located in Serignan-du-Comtat, which is between Orange and Avignon. The vineyard combines all traditional grape varietals for the Southern Rhne Valley; Grenache, Syrah, Mourvdre, Carignan, and Cinsault. The vines average 30 years old and are planted facing south on terraces in soils deep in calcareous sandstones. The vineyard is certified "organically grown" by Ecocert. This 2014 is a blend of 55% Grenache Noir, 35% Syrah, 7% Cinsault and 3% Mourvèdre aged in traditional large oak foudres. With the deft hand of winemaker Christian Voeux, this blend shows its pedigree with intense red fruit, black cherry notes and exotic spice on the nose. A beautiful freshness on the palate, with berry fruit and savory spice notes. It has a bright, silky texture and the finish is long, highlighted by sweet spices. A taste of La Nerthe quality at a very affordable price.